"Sokoot" is the follow up to his first album "24-Saa'at" which made him into a star. 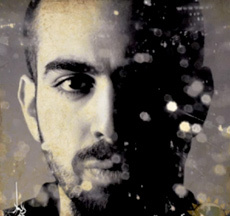 Bahram has a unique delivery and penmanship, most of his lyrics reflect on the problems facing the youth in Iranian society and his personal struggle. in a current Facebook poll he and Najafi are the most popular Iranian emcees. Download "Sokoot" here. آدمی خوبی هم هستند که تعدادشون هم زیاده و این چیزی هایی که تو آهنگ هات گفتی راجعبشون صدق نمیکنه. Makes you proud and at the same time hopefull! They get it, far better than us! He speaks from the heart and thats what its all about! Rap is not approved by the islamic government specially this album with its critical tone will certainly not get a publish permit from the ministry of culture hence it was published online amongst many Persian hip hop blogs. Bahram's work is great! I'm very impressed! Was this album actually published in Iran? The best Iranian rap ever . Exteremely COOL and vey moving! EN TARZA JANGA BEJANG ! THANK YOU!